Tuition: Early registration tuition (ends 6/19): $575 $625 for HSLDA Members/$675 $725 for non-members. Description: AP® English Language and Composition takes a step-by-step approach to exploring the elements of good writing and critical reading. As students learn new writing methods and techniques each week, they complete assignments designed to provide ongoing practice and feedback. Watch a short introduction from Master Teacher Janie Barbosa. Additional class times may be added to the schedule later in the registration period. If you have questions, please call 540-338-8290 or email academy@hslda.org. What topics will I learn about in English Language and Composition? To produce documents that effectively communicate with mature readers. Integration of the dynamics of mature writing for effectual communication of the Christian faith. Rewriting text based on feedback. How much homework is in English Language & Composition? AP® English Language & Composition is a rigorous, college-level course. We estimate that the course workload will take 10+ hours per week. One research paper (8–10 pages). As part of this assignment, students will complete thesis writing exercises, outlining assignments, rough drafts, and peer review of drafts. What books will I use in English Language and Composition? The official AP® English Language and Composition Booklist is now available. In the offical booklist, you will find information about the editions, book descriptions, and the reasons why HSLDA Online Academy selected these books. Am I ready to take English Language and Composition? This is a rigorous, college-level course. To succeed, students should already have strong reading and writing skills. 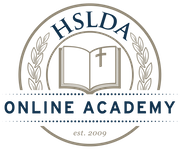 HSLDA Online Academy recommends that students complete at least one high school English course at an advanced or honors level before enrolling. Please visit the College Board page about AP® English Language and Composition for more information about the material and skills students will study in the course and will need to master for the AP® exam in this subject. Still have questions about whether you are ready for an AP® course? Please visit our Academic Readiness page for more information. What is a Live Online Class Session in Language and Composition? What if I have a schedule conflict with listed Language and Composition class times? What is the tuition for English Language and Composition? HSLDA members save $100 on yearlong AP® courses!